In northwest New Jersey, Trout Unlimited has been putting an emphasis on working strategically throughout the watersheds of Lopatcong Creek and the Musconetcong River. In order to achieve this goal, we must work cohesively with those like-minded organizations, communities and funders to put meaningful conservation practices on the ground. As part of the New Jersey Highlands Cluster, a sector of the larger Delaware River Watershed Initiative, TU has gone door-to-door — or shall I say streambank-to-streambank — to engage communities and educate landowners on the benefits of having a contiguous and healthy riparian corridor. For anglers, the first benefit that comes to mind is shaded rivers producing cooler water temps. Eventually, some of those streamside trees fall into the river to create a favorite fishing hole. These native trees and shrubs also benefit landowners and local infrastructure by slowing flood waters when they overtop the bank, stabilizing banks to mitigate land loss via erosion, and rebuilding the natural floodplain. They benefit the nearly 15 million people who depend on the Delaware Basin for clean drinking water by filtering polluted runoff, replenishing groundwater supplies and increasing water quality. Resident mammals and migratory birds reap the benefits of our plantings of native trees and shrubs that provide rearing habitat, year-round food sources, and corridors to travel. These plantings beautify the river and communities that reside along them. Thanks to the generous support of the William Penn Foundation, F.M Kirby Foundation, and National Fish & Wildlife Foundation TU has the capacity to work with landowners, engage partners, and install native buffers along the stream. 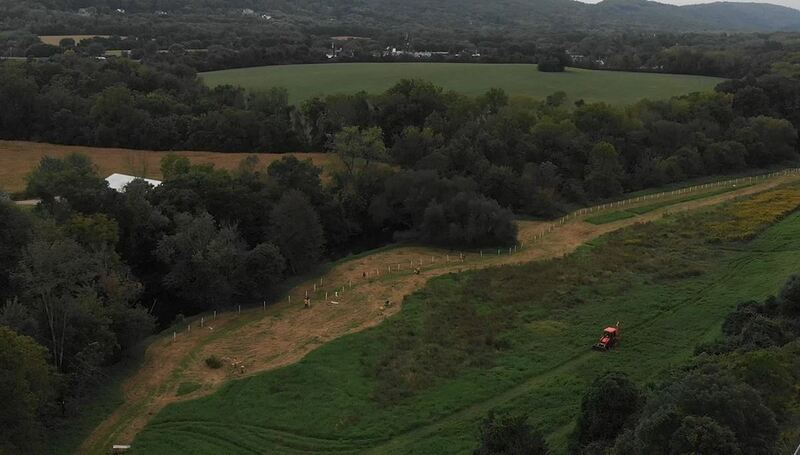 In 2018 alone, TU worked with NJ Audubon Society, North Jersey RC&D, the Musconetcong Watershed Association, NJ Youth Corps of Phillipsburg, and NJ TU chapters to install nearly 2 miles of native trees and shrubs along 16.5 acres of riparian area that was once nothing but open space. Using these outreach funds, we were able to leverage funding sources for native trees and shrubs such as the Nature Conservancy’s Roots for Rivers tree program. 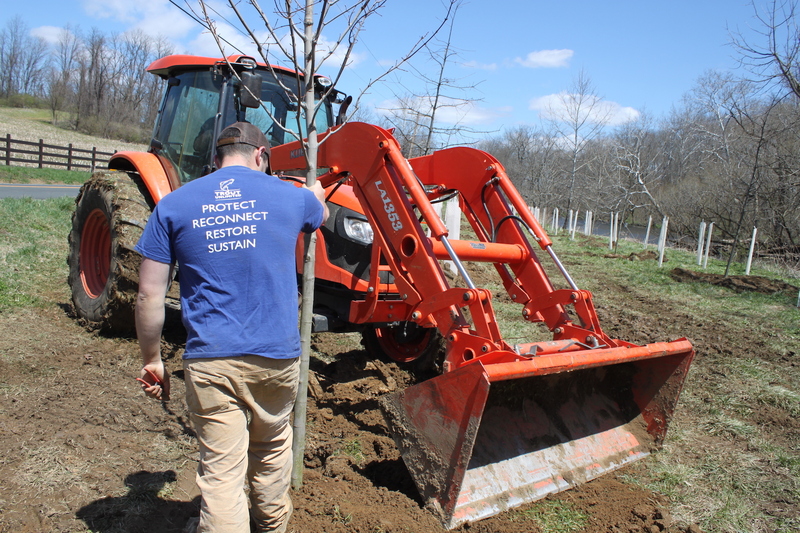 Most of the trees planted (below) were 10- to 14-foot balled-and-burlapped native sycamores, oaks, maples and redbuds, adding an immediate benefit alongside the smaller spicebush, viburnum and chokeberry that will produce food for wildlife. To help get these projects done, local youth were engaged and educated through the Youth Corps and TU chapters donated hundreds of volunteer hours. The work does not stop here. TU is already planning for a busy spring restoring riparian corridors across NJ’s best trout streams. If you own land along a New Jersey stream or know someone who does and want to partner with TU to put conservation practices on the ground in your backyard, please contact me at cbaldino@tu.org. Check out the link for an on-the-ground look at what these projects look like; https://www.youtube.com/watch?v=WqO6YbG42mE. Cole Baldino is Trout Unlimited's New Jersey Delaware River Coordinator. When he is not working to improve trout habitat and water quaility in his project area he usually can be found with a fly rod in hand working to catch big wild trout.